The following are from a BWY Cruising Club event which we attended while migrating north. I have been asked by many what the most important not standard item is for a cruising vessel and until this event did not know the correct answer. Usually I would say the roller furling. Club affiliation proved itself to be the most important item in that in an adjustment to the motor lifting mechanism on Murrelet that otherwise would have had to have been tolerated for five weeks could be made. The engine once lifted, slowly would place itself back into the water. The adjustment, while simple and well documented and known to the crew, required a particular alignment for a screw driver that I just could not figure out. The pictures show that (for Mac26x owners) there are a lot of resources to draw on both in the knowledge of other club members and the spare parts stored on like cruisers. 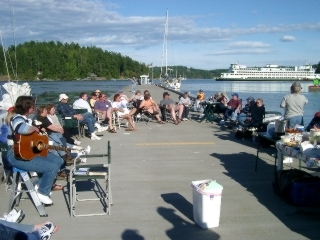 The Owners’ Rendezvous are one of the first events to schedule according to Sailing (May 2004 page 71). This 13th year event will take place at the Port of Anacortes Cap Sante Marina on Friday, Saturday and Sunday August 15th-17th 2014. During this time special activities are being held, for both children and adults. Keep in mind this is a boat centric event and so most activities are boat and pirate related. There will also be cannon fire from some of the boats and this would make this event a not so pet friendly place to bring your pets. As always, the public is welcome to enjoy all activities, including and not limited to music on the docks performed by tropical-rock star Dave Calhoun on Friday and Saturday. On Saturday we have blindfolded dinghy races, pirate costume contests for both children and adults, best dressed boat contest, and children’s pirate piñata games. In the back to basics style I have consolidated this years party by bringing in two concrete barges to the C-Dock to accommodate dancing and general milling around along with a place for the bands to play and you to dance at. This will bring everyone together to socialize and also better hear the music and raffle prizes. The evening of Saturday the 16th we’ll have a raffle with proceeds going to non-profit charities and costs incurred for this event. Afternoon entertainment will be provided by (TBA) . We also have the world famous author/sailor and publisher of Cruising Outpost Magazine, Mr Bob Bitchin on hand to write a feature article on this event for the magazine.